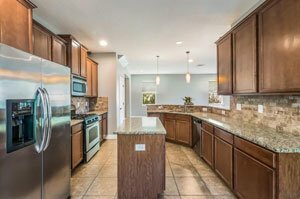 Oak Vistas is a community that local realtors have to be quite familiar with, as it is located just adjacent west of the offices of the Realtor Association of Sarasota and Manatee on Cattlemen Road. This neighborhood sits on the northeast section of Sarasota Springs, north of Webber Street and east of Honore Avenue, a domain for some of Sarasota’s popular bedroom communities. Oak Vistas’ acreage, which lies south of Bahia Vista, is an interior parcel accessible via Hageman Road from Cattleman. This area is dominated by the bedroom community of Colonial Oaks whose neighborhoods spread south and west of Oak Vistas. Sarasota homes for sale in Oak Vistas are of newer vintage than those in its surrounding neighborhoods. The development of this community began in 2005, but the 2006 housing crash stalled completion of building out its 69 home sites and only a dozen houses were built. Home construction in this community resumed in 2010, with national builder D.R. Horton taking over the development of the property. This Fort Worth, Texas-based company introduced in Oak Vistas some of its popular models, like Laurel II and Wisteria, and eventually, the community was built out in 2015. Besides the D.R. 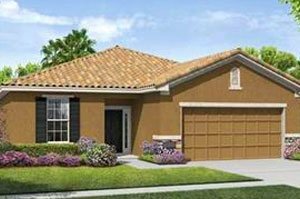 Horton builds of Oak Vistas homes for sale, prospective buyers can also choose from the pre-2010 houses constructed by Sarasota-based custom builder Maglich Homes. Oak Vistas homes for sale are designed as one- and two-story single family residences with Mediterranean-inspired architecture. 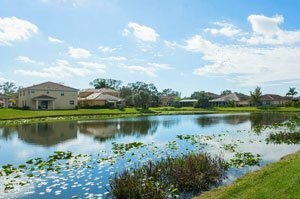 The prime choices in this community are those residences in lots backing up to one of the property’s two spring-fed lakes providing picturesque views to their residents. Typical pricing of Oak Vistas residences hover in the $300s and the $400s for sales listings with floor areas of between 1,776 square feet and 3,700 square feet designed with three to five bedrooms. Oak Vistas homes are of concrete block and stucco construction with two car-garages and barrel tile roofs. These dwellings impress buyers with their modern kitchens with granite counter tops and stainless steel appliances, tile and wood flooring, master suites with walk-in closets and high ceilings. Overall, Oak Vistas’ home floor plans provide greater space, luxury and comfort. Many of these homes are still covered by the 10-year structural warranty of their builder. Home values at Oak Vistas have the potential to appreciate handsomely, as the residences of the community are not only well built but also enjoy proximity to the amenities that have helped strengthen the Sarasota real estate market. Some of the top local schools, for instance, are just nearby, including Brentwood Elementary, McIntosh Middle, and Sarasota High. Easy access to Interstate 75 and to vital road corridors, furthermore, bring Oak Vistas residents just minutes away from plenty of options for dining and shopping, as well as entertainment. Amongst these destinations are the Mall at University Town Center and its neighboring Benderson Park accessible northwards via the interstate. Downtown Sarasota and the pristine beaches at Siesta Key, in addition to the chic shops and cafes at St. Armand’s Circle, are all within easy reach as well from the delightful Oak Vistas community. Below are the current real estate listings available at Oak Vistas.